This villa, one of the original Porto Rafael houses, is a spectacular, tastefully refurbished family home, with plenty of sunny terraces, a large designer swimming pool and beautiful gardens all contained in a wonderfully private and secluded setting. An expansive open plan kitchen fully equipped to cater for a large family. A comfortable and stylish living room/ dining area for 8/12. A separate bar area with drinks fridge. Master bedroom and en-suite bathroom with shower and large bathtub, with direct access to a peaceful patio and Mediterranean garden. Double guest bedroom overlooking swimming pool and small patio with lemon tree. 3rd double bedroom/children's room with 2 sets of bunk beds. Another modern family bathroom with shower. Double bedroom and en-suite bathroom with private access to a wonderful roof-top terrace with spectacular views across the sea and islands. Double bedroom with en-suite bathroom, air conditioning and its own personal small kitchen and washing machine. This also has its own access to a private terrace overlooking the sea. 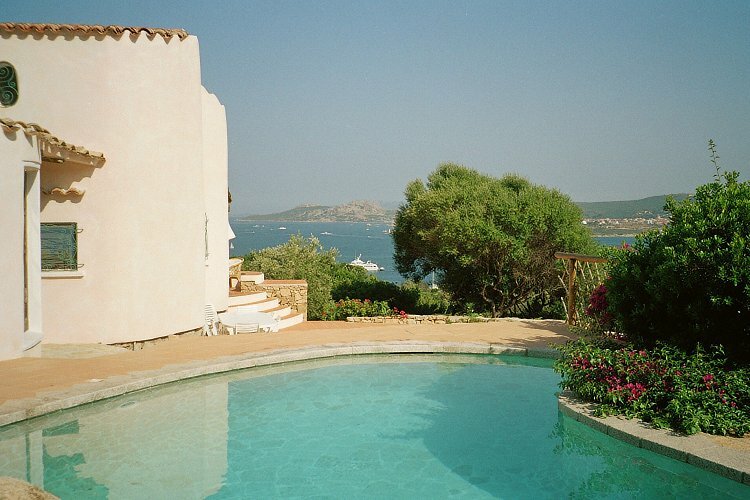 The villa is south facing across the Archipelago of La Maddelena and offers a view of the amazing Mediterranean sunrise. There is a wonderful shady terrace looking directly over the sea with a large dining table carved by local craftsmen made of scented juniper wood and a relaxing outdoor seating area. A second outside terrace is bliss itself with soft sofas and chairs – a cool corner to relax in and enjoy! Further large terraces offer ample space for sun bathing in private and secluded settings. The large heated designer pool creates the last touch of luxury emulating a mountain rock pool and fitting snugly into the local landscape. The pool, set amongst bushes and trees of Bougainvillea, Lemon, Rosemary, Myrtle, Pomegranate, Carob, Pine, Olive, Oleander and Cactus, creates an unbelievable oasis of peace and beauty. The villa is not overlooked and is hidden in a peaceful corner. In fact, it offers one of the highest standards of accommodation in Porto Rafael. There are tennis courts within walking distance. A beach is less than 300 meters away and very easy to reach with babies and toddlers. The famous and quite stunningly beautiful piazetta, with its tiny chapel of Santa Rita, shops and bars, is also walking distance. There is a supermarket/perfumery, with international press and a few fine restaurants as well as a first class medical service solely for the residents. The beautiful marina port of Punta Stroppello (HQ of the Yacht Club Punta Sardegna, where every August the famous "Regata Formenton" is organized) is only a stone's throw from the villa. From here you can practice diving, wind surfing, snorkeling, sailing, catamaran, open-ocean-kayaking, mountain bike and beach volleyball. Diving centers with instructors and equipment are at your disposal for marine excursions and PADI courses at all levels to obtain relevant licences. You can also rent motor-boats to do your own private touring of the many islands. Olbia airport is 40 min drive by car. This small village is a jewel nestled on the North East coast of Sardinia's Costa Smeralda, with pink/white sandy beaches and crystal clear waters. (The water is so clear that the locals call it Piscinas - which means "swimming pools"). It enjoys a number of local amenities including a 24 hr private guard service which ensures maximum security for all residents. All the village houses and villas of Porto Rafael are built in a way that totally respect nature and they are carefully dotted around the hillsides, hidden in the Mediterranean bush and stunning, almost sculptured Sardinian rock.